I'm teaching a class how to do PCR & gel electrophoresis soon and would like it if you could check through my basic step by step instructions - it's a while since I've done one. Is there anything there that is wrong, missing, or should be excluded in the following? A) Collect all ingredients from the refrigerator and keep cool (on ice). Leave the TAQ in the freezer until required. W) Take the gel to the UV camera and take a picture. Large DNA molecules move through the gel slowest so will be nearest to the wells. Collect all ingredients (excluding TAQ) from the refrigerator and keep cool (on ice). Leave the TAQ in the freezer until required. Make master mix by adding all ingredients (excluding TAQ) using fresh pipette tips for each ingredient and using the volume specified in the PCR reaction mix recipe. Vortex & lightly spin down on a centrifuge. Add the required amount of TAQ to master mix (insert in to the liquid) and mix using the pipette to draw some liquid up and down. Add master mixes to labeled PCR tubes in the required volumes as specified by the protocol. Add DNA to PCR tubes (using fresh pipette tips for each DNA sample) again using the volume specified in the protocol. Label your tubes carefully (and on both the lid and tube). Lightly spin down the PCR tubes on a centrifuge. Run PCR in the thermocycler according to your protocol. Collect samples from thermocycler and place in fridge until needed. Make 1xTAE (enough to make the agarose gel and to place in the electrophoresis apparatus). Make an agarose gel (about 5 mm thick) by melting agarose and 1xTAE in the microwave; allow the liquid to cool a little before adding it to the mold. Once the gel is cool, place it in the electrophoresis apparatus, cover it with 1xTAE (just covering the gel) and then remove the comb. Collect the PCR products from the fridge/thermocycler. Make spots of loading dye on parafilm. The loading dye is premixed with GelRed so your samples show under UV light. Add one sample to a spot, mix it by drawing the liquid in and out of the pipette tip, and then carefully add to a well in the agarose gel. Take care not to puncture the gel or spill any of the liquid out of its well. Discard the pipette tip. Repeat the previous step for each sample and for a negative control (master mix and milli-q water instead of DNA). Use a fresh tip for every sample. Load PCR Ladder, also mixed with loading dye, in to a well. Connect the electrophoresis apparatus to a power supply, with negative electrode (black) nearest to the wells containing the samples. Set the power to run 80-120 volts. Wait until about a finger-width gap appears between the blue and purple bands (approximately 20-30 minutes). Disconnect the power and collect the gel carefully from the liquid. Take the gel to the UV camera and take a picture. Large DNA molecules move through the gel slowest so will be nearest to the wells. The order is Control, female, male, female, male, female, male, ladder. Males have one band, females have two. The final pair didn't show too well on the picture but were clear enough on the screen in the camera room. Thanks for the tips everyone! Sorry the picture is low quality. Feel free to recreate these guidelines but remember to credit the Biology Stackexchange Community! Not the answer you're looking for? Browse other questions tagged lab-techniques pcr gel-electrophoresis protocol or ask your own question. 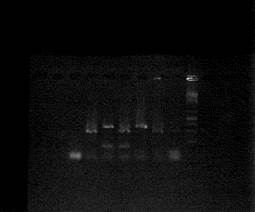 Agarose gel electrophoresis - wrong running conditions? What is 'exhausted buffer' in gel electrophoresis?